This has been another successful month, moving forward. As I write this our new vehicle is either just off the coast or has landed at the Port of Mombasa. It a ‘gently’ used 14 seat van, that is being imported from Japan. Our fundraising appeal was incredibly successful and provided the remaining money, $3,500.00 of the total cost of around $18,000 Cdn. The remaining money raised in this appeal will go to the final touches on the building including paint, furnishing and the ‘landscaping’ around the building. In fact we might have some additional funds beyond that which will be put in a fund for our next goal – a play space. There are two plots of land adjacent to the residence. Henry and Ruth are in negotiation to purchase one of these parcels of land. Right now our orphans use Ruth and Henry’s front yard/drive way as their play space. What was once grass has become bare earth – dusty in the dry times, mud in the rainy season. Imagine having 40 or so children playing on your property! Ruth claims – always with a smile and a laugh – that she loves them being there, although I think Henry was less than pleased with the two broken front windows. Once the land is purchased the next steps will happen. We will fence the area to make it part of our compound, put in soccer nets, volleyball poles, and a playground. Kids – no matter their circumstances – have both a right and a need to play. The Kenyan school year is the calendar year with new grades starting in January. In November those students in grade 8 take National Exams to determine which level of school they will be able to attend. Those who score highest are able to attend the highest level schools – the National Schools. These are also the most expensive. We have made a commitment to our orphans that we will fund the highest level that they qualify to attend. While we won’t know the final totals/numbers/schools until early January. We are projecting that we will have 43 students in high school or post-secondary. While the majority of these students are directly sponsored we have a number of siblings or needy community children who are funded but not sponsored. We are gathering extra funds from schools and individual donations to cover these costs. As well, the first year – Form 1 (grade 9) – has a whole series of additional costs as the student must attend the school with an array of supplies that include things like water basin, mattress, water container, personal supplies, and of course purchase of school uniforms/equipment. This cost is in many cases equal to the cost of the whole year of education. We are going to have a dozen children entering Form 1 next year so this is an additional cost. One of the ways we will also be covering these school costs is through the launch of my book My Name is Blessing. 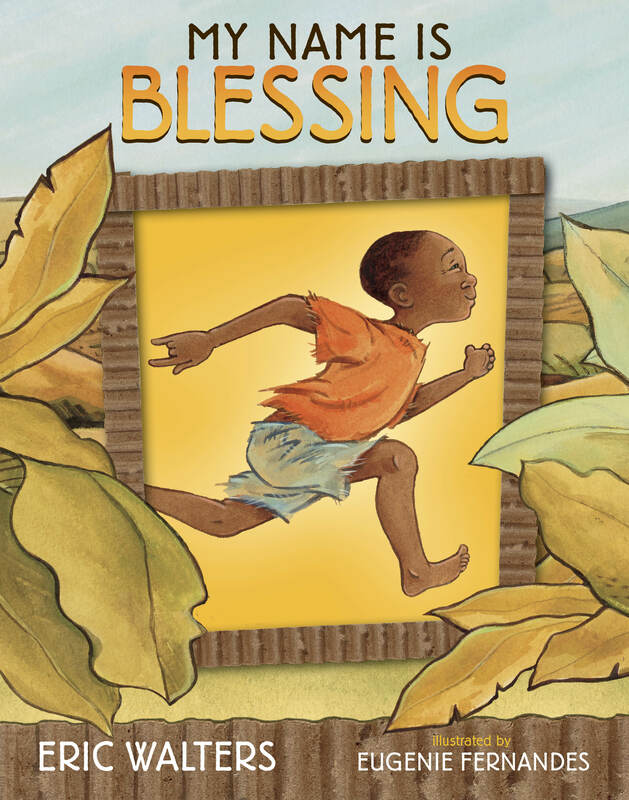 This is a story about one of our children, Baraka. There are a few extra elements to this launch. The illustrator – the wonderful Eugenie Fernandes – has donated all the artwork in thebook, which will be sold at the launch. In additional we have granny bags – made by our grandmothers – and Kenyan jewellery, wood and stone carved animals and assorted other items, which will be for sale. All of the proceeds will go directly toward the program and be used for tuition and other school needs. The launch will be at Bar Italia, on College Street, in Toronto, on the evening of November 19th. While space is limited, if you wish to attend please rsvp at rsvpcanada@randomhouse.com. It seems so early to be talking about Christmas but in terms of our timeline we’ve been discussing it with our sponsors for the past month. We asked our sponsors to make a donation to their sponsored child of up to $35.00. We often shock people when we put an upper limit, but we are clear that this is sufficient money to purchase wonderful things – most often clothing and school supplies and quite often a small toy. Already the majority of our sponsors have made a donation – many of which were much more than that. We use the additional money to provide Christmas presents for siblings, cousins, other orphans in the community as well as needed items for the homesteads including tools, blankets, seeds or solar lights. 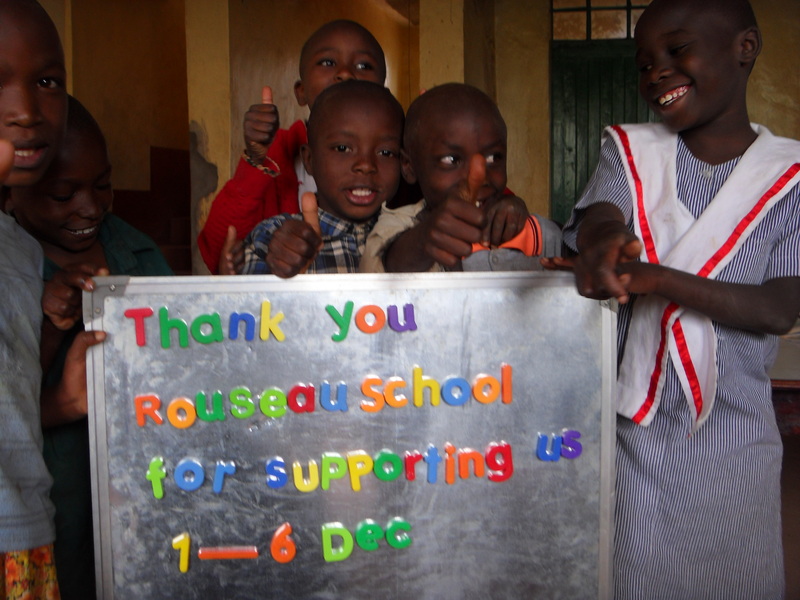 Below is a letter from our friends at Rousseau – under the leadership of Steve Obermeyer. 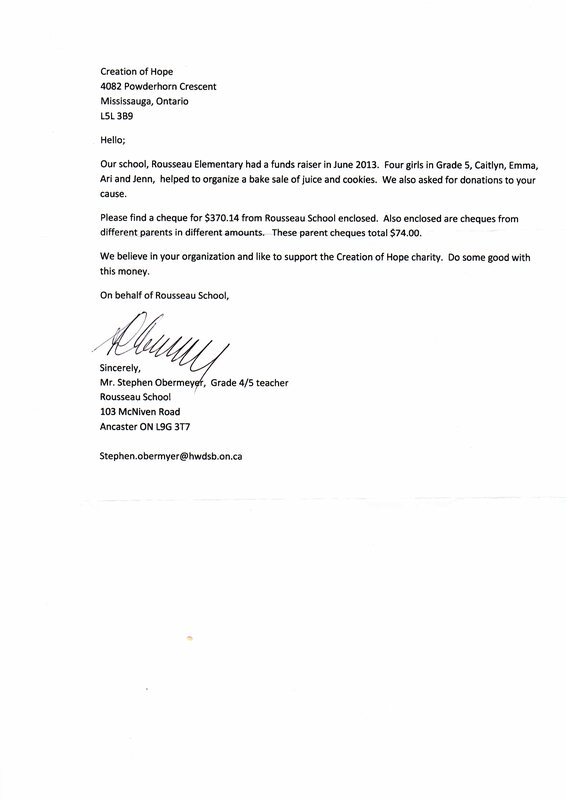 LaSalle Public School, in LaSalle, Ontario, under the direction of Martha Martin, remains one of our most faithful fundraisers. This year they raised another $2,500.00! This money will in part go toward the tuition of two unsponsored students, Faith and Eric. Again, great thanks. The community leaders at Stride Avenue Community school have once again made a donation of $300.00. This will be used to support the residence for 4 days in the coming months. Lisa Farlow – who is a sponsor in the program, volunteered for 3 months in Kenya, and runs our website – undertook a 24 hour Crossfit challenge. While she was challenging herself she challenged her friends to make donations. She raised $950 which go a long way to support our program. Stephanie Prodea, a McMaster University student and friend of the program, is researching a new product line – a natural health food which involves a morning ‘smoothie’ blend to restore, detox and cleanse. She made a collected and personal donation which will be used for monthly food distribution in the coming months. Laura Mead, who lives in Prince George, made another donation to the program. This will be applied to support the entire Rolling Hills Residence for 2 days! Debbie Stanley donated money which has been applied to 2 days of support for the Rolling Hills Residence – see the thank you sign below. 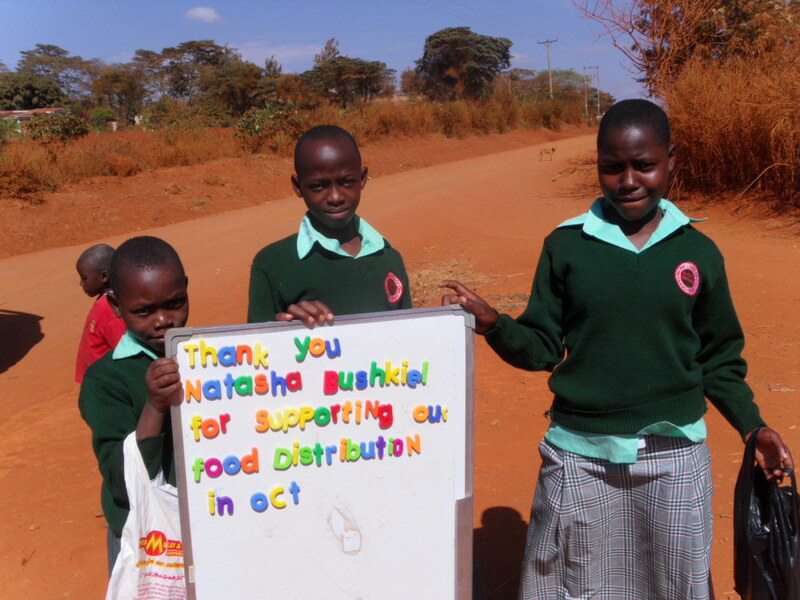 Natasha Bacchus-Buschkiel made an incredible generous donation that is being used to both support the Rolling Hills Residence for a number of days and also to support a monthly food distribution – see the thank you signs below. Deb Froese made a donation that will be applied to supporting the entire Rolling Hills program for 1 day! Timothy and Krista Labelle made a donation that will be used to support the entire Rolling Hills Residence for 2 days! We are in a transition stage around daily donations. For the first years of our residence we were able to say that $50.00 per day supported the entire residence; food for between 25 and 40 children, routine medical care, school supplies, the salaries of the matron, night watchman and tutor, and the sanitation and water and electricity for the building. With some donations that have just come in we have kept to this commitment. However as we have grown our expenses have increased. As well inflation and the exchange rate have also impacted on things. We have now calculated that the cost is actually closer to $75.00 per day. We now have 52 children in residence. We have higher costs now which include routine medical care, more school supplies and a need for a much larger amount of food – as well as the increased cost of food. These are all major contributing factors. In addition we have a greater number of staff. In addition to the matron Sarah, we have a caretaker, Paul, who cares for the boys, a cook, night watchman, tutor and a community outreach worker, who helps in the home but also with orphans in the community. While we still have bills for sanitation and electricity we no longer have to purchase water! All of our water comes from our well… of course there is an electrical cost to pumping it to the building but this is far less than purchasing water. It’s rather amazing how much water is necessary to run a ‘family’ of 52! While the vast majority of the money necessary to pay for the food distributed to the orphans in the community comes from our sponsors there is always a short-fall because we provide food for the extended family members/siblings that often exceeds our donations. Additional donations are used for these. I love goats. I think I say that every month. 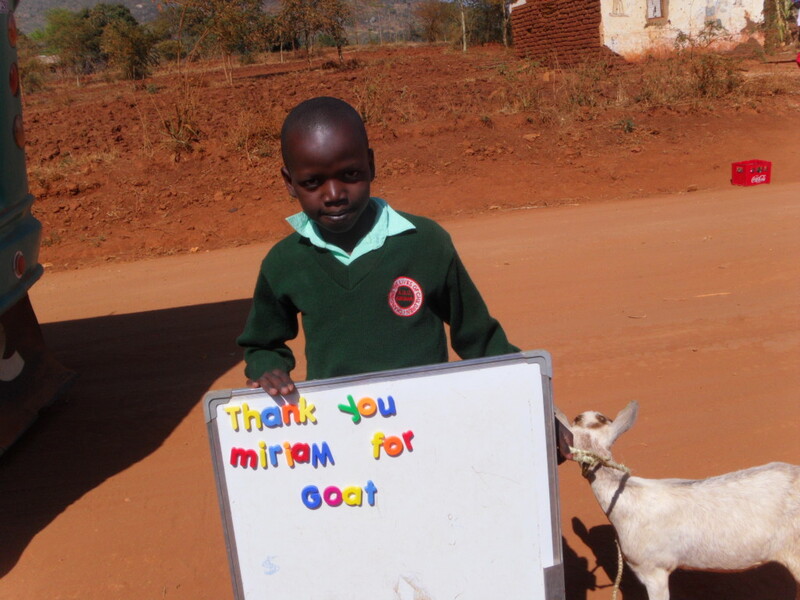 I love them because goats change lives. One goat will provide milk – an incredible food source – as well the potential to breed and sell the off spring. One of our grandparents, Grace, has 7 orphans, and the seven goats that we have given provide the opportunity to breed and we then purchase the goat kids back to give to other orphans. To understand the economics of this, we purchase a goat for $40.00 from Grace. This is approximately 3 times her normal monthly income from other sources. 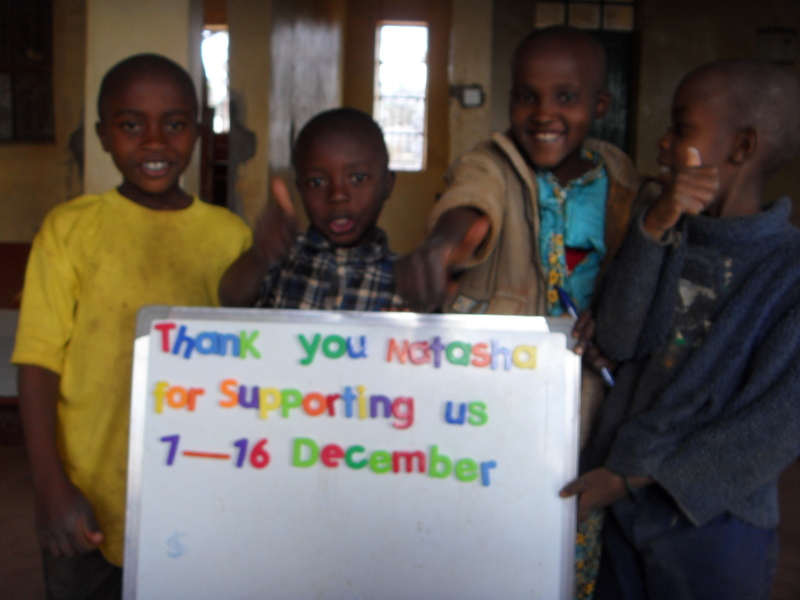 As noted above our generous sponsors – 117 in total – have already provided donations for Christmas presents. As well some have mailed over parcels. 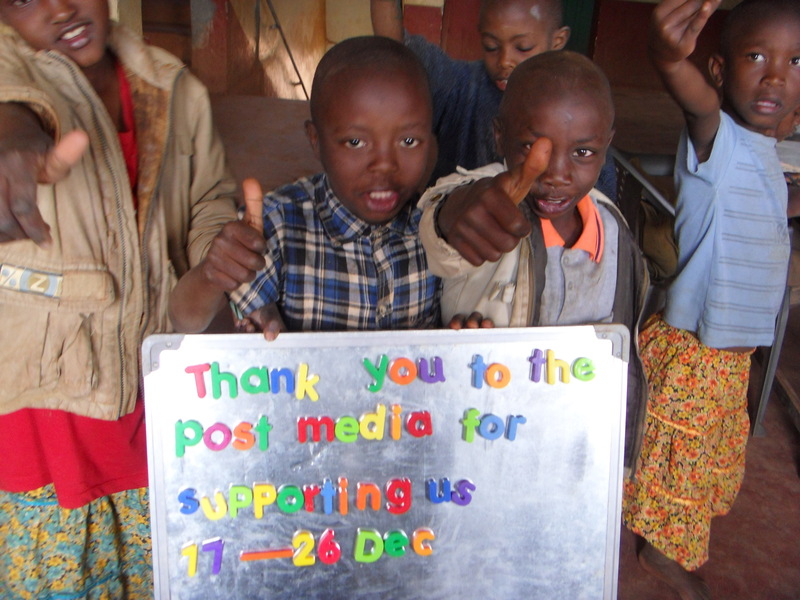 In January you will see pictures of the children receiving their presents. We are often approached by people who wish to become sponsors. We politely, and gratefully explain that at this time we are not taking on new sponsors. The program continues to be run off our dining room table and we decided, in conjunction with Ruth and considering the limitations in our staffing in Kenya, that we are not currently in a position to manage more sponsors. 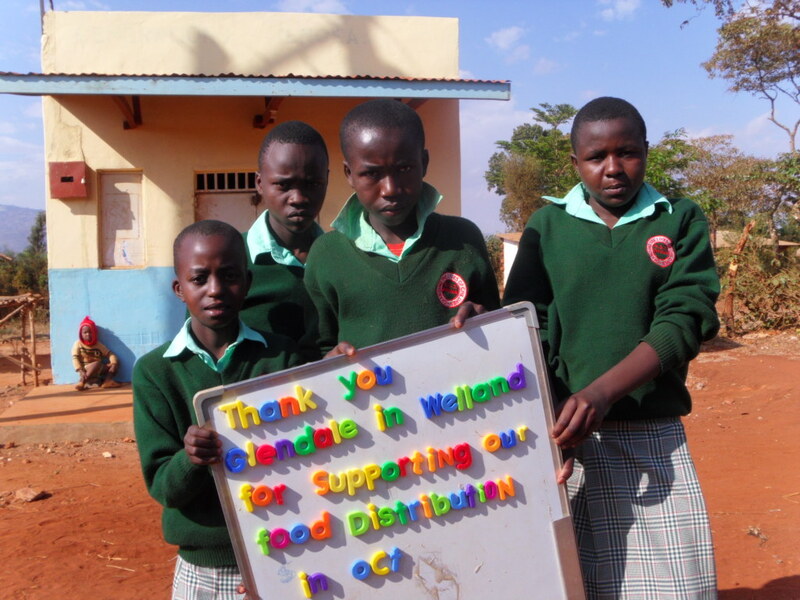 Still… we gratefully accept all ongoing donations which are used in to support all the orphans in the program. We gratefully acknowledge all our sponsors, supporters and friends!